Writing under a pseudonym has a long and honorable history. Several of the Founding Fathers contributed to The Federalist Papers under the name of Publius. Eric Blair’s pen name was George Orwell. Samuel Clemens wrote under the name Mark Twain. Bill Schmalfeldt has used a host of fake names, but not always for the best of reasons. He had been fired more than once by The Examiner, but he got back on using an assumed name to hide his identity. As shown in this post from five years ago today, How I Cracked the Case, his scam didn’t survive very long. The Cabin Boy™ wonders why he wasn’t able to maintain his sekrit identity as Clark Kent Matthew Lillefielt for a whole week. The answer is that he is mind-bogglingly clumsy with operational security. Although I saw no need to mention it, I’ve been aware of the Matthew Lillefielt ID for quite a while. I stumbled on it when I went to document one of the videos he had posted. 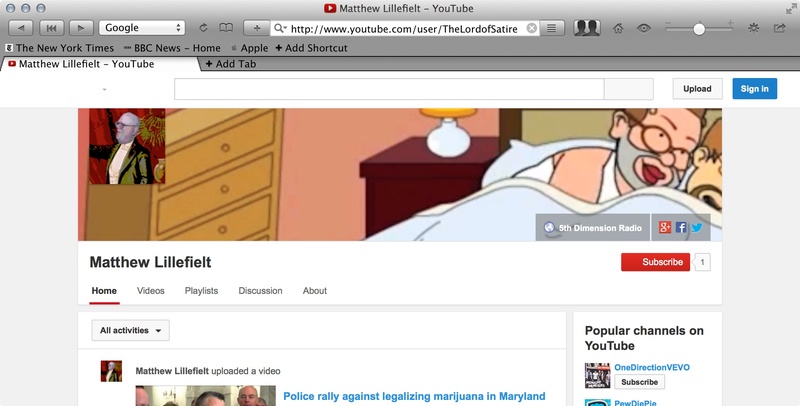 I went searching for his The Lord of Satire YouTube channel, and found this: There’s the Cabin Boy’s™ portrait inset into a banner from one of his pornographic animated videos, and there’s the name Matthew Lillefielt. The game was over before he put his quarter in the slot. Of course, The Examiner fired him again, but firing is something that the Cabin Boy™ should be used to by now. This entry was posted in Team Kimberlin, Trolls and tagged Cabin Boy Bill Schmalfeldt, Pseudonym by wjjhoge. Bookmark the permalink. I like to listen to different small radio stations around the country to get a feel for what goes on in each place. Luckily even small stations now have online streaming. I was listening online to KPQX out there in Montana and noticed that a voice I’d heard before is suddenly missing. Wow, I hope nothing bad happened to that DJ. Seems strange that their voice has been silenced so suddenly. Did Bill Matthews get fired yet again? Wonder what the problem is that all these radio stations don’t see the immense talent in front of them ? Did he fix her teeth yet? Hahahaha. Like that is ever going to happen. Why hasn’t FoxNews ever run a story about Cowboy Blob’s miraculous recovery from Parkinson’s? Not only did the Manboob who Nutshuffles© get out of a wheelchair and, well, nutshuffle, but Curby Porkinson managed to drive! (Though not so well enough to not scrape up his rims). Apparently he is claiming he quit. Maybe that icy parking lot was just the last straw. Now for that multi-day bus ride in the cold from Montana to South Carolina. Given his Stage Bazillion PD it will surely be his end.